Oncology patients still lack access to adequate oncology services in KwaZulu-Natal, despite assertions by Health MEC Dr Sibongiseni Dhlomo, that six machines would function in the province by January 2018. 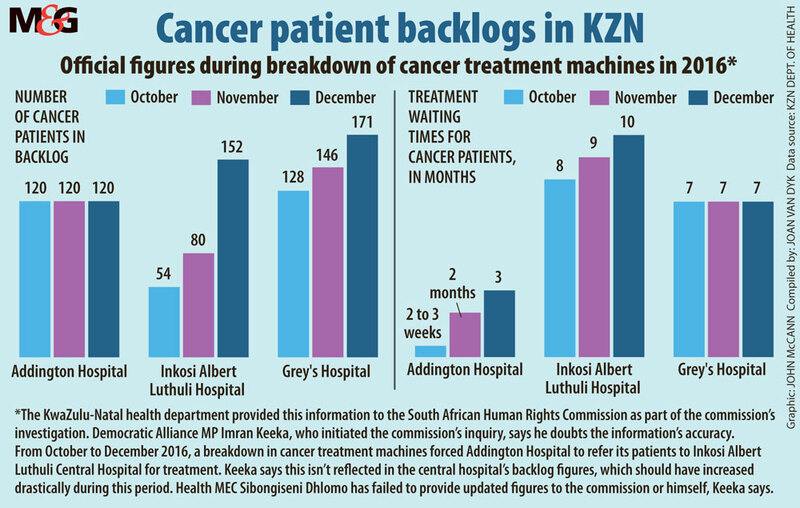 This problem is not a new one – the problems with Oncological services in KZN hospitals can be traced back at least as far as 2013 when the province’s state hospitals first started experiencing backlogs in the treatment of cancer patients. Patients diagnosed with cancer had complained of having to wait for far too long for treatment due to the lack of working radiology machines and CT scanners. Problems with the machines started in January 2013 when the Department of Health cancelled a contract with a service provider. At the time, Health MEC Sibongiseni Dhlomo said that part of the reason for the backlog in the cancer treatment is the high volume of patients requiring the service, which leads to machines breaking down frequently,and that the province was dealing with a larger pool of patients as it has to cater for people coming from Swaziland and Eastern Cape as well. “When these machines break, we have no luxury of time to repair them. Repairing a machine of that magnitude is not like going down the street and getting a pin there,” he said. Dhlomo said some of the parts had to be imported from abroad, which led to logistical delays, and also, lack of staff training also contributed to machines breaking down frequently. He did not elaborate on why staff were inadequately trained to operate the machines. Although Dhlomo admitted the shortcomings in the programme, he said the backlog had been “sensationalised”. “Not all patients who have cancer, must necessarily get radiotherapy. This story of saying ‘there is not enough machines, I am going to die’ is a fallacy. Patients can still do well under chemotherapy,” he said. In December 2017, Dr Sifiso Mtshali, head of the department of health, resigned after being suspended by KwaZulu-Natal premier Willies Mchunu, pending an investigation into the irregular and illegal repair of oncology machines at the Addington Hospital in Durban. In a statement, Mchunu said he had been in ongoing consultations with the provincial executive, including Health MEC Dr Sibongiseni Dhlomo and Finance MEC Belinda Scott. Dhlomo stated at Pietermaritzburg’s provincial consultative health forum on November 22, 2017 that it would be “a month or two” before the oncology machines were “up and running again”. The DA’s KZN health spokesperson, Dr Imraan Keeka, said Dhlomo’s promises were false. “It is more than six months since the South African Human Rights Commission (SAHRC) gave the KZN health department their binding recommendations to improve oncology services in the province. Yet, the waiting times are longer and the situation is worse,” said Keeka. The SAHRC report, which was made public in June 2017, slammed the KZN health department for failing to provide adequate oncology services. It found that national and provincial health departments had “failed to take reasonable measures to progressively realise the right to have access to health care services in the KZN province“. Keeka added that radiotherapy machines at Addington Hospital were still out of service. “The machines at Inkosi Albert Luthuli Central Hospital are working but cannot cope with the volume of patients and the added complication of a lack of doctors and staff in the oncology department,” he added. KZN Department of Health spokesperson Ncumisa Mafunda, conceded that the department only had three functional radiotherapy machines in the province. She added that Addington Hospital had no oncology machines, but was planning to install two in the coming months. “Both the installation of a new machine and the completion of repairs to a second machine at Addington are expected to be completed by April,” she said. Keeka was also critical of severe oncology staff shortages throughout KZN. “The current situation is that there are only two full-time oncologists in KZN and they are based at Grey’s Hospital in Pietermaritzburg“. Mafunda stressed that oncologists were scarce and that their training could only commence once more consultants become available to train registrars. “The KZN health department has an arrangement with the Western Cape health department whereby three registrars will soon be assigned to accredited facilities in the Western Cape“. Of these three registrars, one is expected to write final exams in mid-2018. “If all goes well, this person will return to KZN thereafter as a specialist oncologist,” said Mafunda. The SAHRC did not wish to comment further and said ” the oncology matter is an ongoing investigation“. Patients tell a Different Story…. Alice Sibiya emerges from her bedroom, her jaw clenched. She carries three transparent plastic bags in her hands. Sibiya moves purposely across her small living room in Inanda outside Durban. She lowers herself on to a couch and places one bag on her lap and the other two next to her. Where Sibiya is seated, wearing a dress with blue and purple floral details, she is framed by gold curtains with clasps covered in artificial jewels. The subtropical sun is softened by a net curtain with faded embroidery. Sibiya is in pain, but she’s trying to hide it. For a moment, she freezes, then begins to unpack the loaded bags. First, a small pill bottle labelled “Paracetamol” hits the table. Then a big box of tramadol, a mid-level painkiller, and three boxes marked “Pain Block”. A tub of Panados. The first bag of pills is still more than half-full. The other two bags of medication haven’t even been opened. On paper, 41-year-old Sibiya is a cervical cancer survivor. But almost two years after doctors at Inkosi Albert Luthuli Central Hospital deemed her cancer-free, she is still unable to work. “They [the doctors] told me I’m in remission. But I think maybe I’m not,” she says, putting pressure on her lower stomach with her palm. Sibiya’s bags don’t contain any cancer medication. All she has is painkillers – the type that are not nearly potent enough for her level of discomfort. Early screening for cervical cancer can be a lifesaver but are nonprofit organisations enough to fill the gap in KZN’s crumbling system? Mthembu and about 50 other women, some with children, have been queueing for hours outside the Umzimkhulu primary health clinic about 110km from Pietermaritzburg in KwaZulu-Natal. By the early afternoon, the floors of the clinic are strewn with apple cores and the leftovers of other snacks mothers had packed for their toddlers. A team of volunteers, social workers and nurses from the nonprofit organisation, the Cancer Association of South Africa (Cansa), is making its way to the clinic along the winding road from Pietermaritzburg. Trailing behind them is Cansa’s mobile clinic, from which the team conducts screening for various cancers, including Pap smears to detect early signs of cervical cancer, which is mostly caused by the sexually transmitted infection the human papillomavirus (HPV). Like many other patients in the queue, Mthembu came to the clinic unaware the Cansa nurses would be there. But she believes their presence is an unexpected blessing. South Africa’s cervical cancer treatment guidelines show the five-year survival rate of cancers diagnosed early ranges between 75 and 95%. Although the government has implemented measures to ensure early detection and prevention, some patients still slip through the cracks at overburdened primary healthcare facilities. Just after lunch, there is still a queue of women waiting for Pap smears. But Smith and her team are packing up to return to Pietermaritzburg. Umzimkhulu’s rural setting forces the team to leave early to avoid driving in the dark. These women will probably be screened at a public-sector clinic. But for them, even early detection may not save them from becoming collateral damage in the systematic collapse of KwaZulu-Natal’s health systems. The National Health Laboratory Service probably won’t have the funds to conduct biopsies for cancer. In May, the laboratory was R1.5-million short on its operational budget and owed suppliers upwards of R850-million. The laboratory runs about 300 clinics and conducts tests for the public health sector.